Electric Scooters: Why Ford Is Getting Into The Scooter Business Money is going a lot of different ways in the car industry. Experts say companies are investing in new technology simply because they don't want to be left behind. Ford is buying electric scooter company Spin in what experts say is the biggest investment of an automaker into "micromobility." A big car company is going small. Ford is buying electric scooter company Spin. Ford and Spin won't confirm the price tag, but reports put the purchase price at $100 million and an overall investment from Ford of $200 million. The acquisition, announced last week, marks the first time a carmaker has seriously invested in the bike and scooter-sharing sector, which is typically the realm of tech companies. Automakers are trying to broaden their business — to become "mobility" companies rather than just selling cars. "I would say that Ford is a bit of a standout among the pack" in that approach, says Valerie Sathe Brugeman, a senior project manager with the nonprofit Center for Automotive Research, who says Ford is unique in pursuing scooters. Spin is a relatively small scooter company — it operates in just 14 markets while rivals Bird and Lime each operate in dozens of cities. With the takeover, Spin is working on expanding to about 100 markets in the next 18 months, according to Spin co-founder Derrick Ko. The way scooter-sharing works is that the electric scooters can be unlocked by downloading an app on a smartphone. They typically cost about $1 to start and 15 cents per minute and max out at around 15 mph. This wasn't Ford's first foray into scooters and bikes. The automaker funded a project at Purdue University that brought 40 scooters to the West Lafayette, Ind., campus. Ford sponsors GoBike, which offers rentals of regular and electric bikes in the San Francisco Bay Area. Ford also sells its own licensed brand electric scooter through a company called Ojo. The scooters go for about $2,200. Ford's move may be the largest, but it's not the first of its kind. Just a couple of weeks ago, General Motors said it was developing two new electric bicycles to go on sale next year. But GM hasn't announced further plans. The reason why traditional car companies are investing in things like scooters, bikes, electric vehicles and even self-driving cars is that there's never been as much competition in getting people from point A to point B in cities. It even has a name: micromobility, a catch-all term for electric scooters and bikes. "All the automotive companies are looking for ways to manage the future," says Bruce Belzowski, the managing director of the Automotive Futures Group and formerly of the University of Michigan's Transportation Research Institute. "In the past, they managed the future by just designing and building vehicles that people really wanted to buy. And now they're confronting a potential future that's different from that." Belzowski says legacy car companies aren't necessarily counting on being profitable when they throw money at new technologies. But these companies don't want to be left behind. With Spin, Ford will be competing primarily with tech companies. 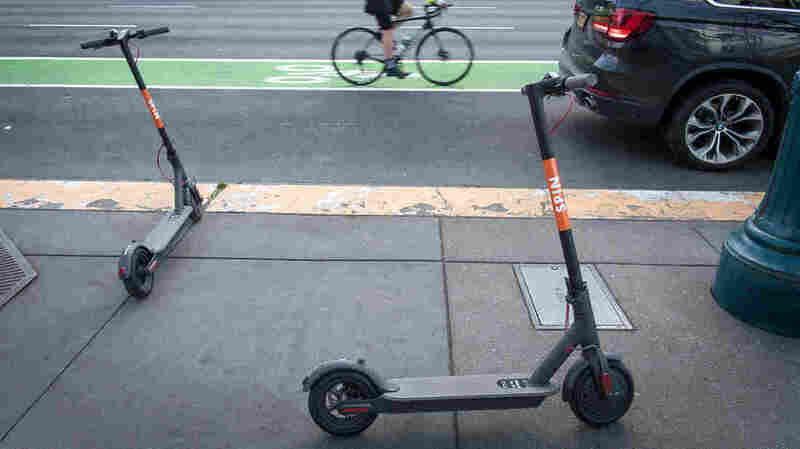 Bird and Lime are the biggest powerhouses in scooters, although they've only been around a year or so. Uber bought the bike-sharing company Jump this year and now offers scooter and bike rentals in addition to cars in certain areas. Uber's rival, Lyft, purchased the bike-share company Motivate. And Lyft also has its own electric scooter rental service in Denver, Santa Monica, Calif., and Washington, D.C. It's hard to keep up with money going in so many different ways. "It's not like a tree, we're looking at, like, a tangled bush," says Ivan Drury, an industry analyst at Edmunds.com. "It's all getting very intertwined easily." For its part, Ford says its electric scooter expansion will help ease traffic congestion, free up parking spaces and reduce pollution. The company also says it wants to take advantage of the significant pool of people who travel short distances. Almost 46 percent of Americans' vehicle trips are 3 miles or less, according to the 2017 National Household Travel Survey. "Spin adds an exciting new offering to Ford's mobility portfolio as we try to help our customers get places more easily, more quickly and less expensively," Sunny Madra, the vice president of the company's Ford X division, wrote. "As more people consider scooters to be a viable mobility option, now is the right time for Ford to work closely with Spin's highly experienced and dedicated team to help expand their service to more cities," he added. Another reason fueling Ford's purchase of Spin goes back to the way tech companies make money: collecting personal information, Drury says. "This is a deal that makes sense because [Ford] will acquire data," he says. "Acquiring and knowing how people are utilizing other modes of transportation in addition to the ones that they already have." For example, Drury envisions a world where Ford learns that a Chevy Malibu driver takes a Spin scooter, now owned by Ford, three blocks every Wednesday. Whatever Ford learns about users, "that is where it becomes even more powerful," he says. Ford CEO Jim Hackett echoed that point on a recent podcast. "We know what people make. How do we know that? It's because they borrow money from us," he told Freakonomics Radio. "And when you ask somebody what they make, we know where they work. We know if they're married. We know how long they've lived in their house, because these are all on the credit applications. We've never ever been challenged on how we use that. And that's the leverage we've got here with the data."